A review meeting for proposed Fred Hamilton ramp designs took place on June 29, 2012. Selected notes from the meeting follow; see PDF below for a complete summary. Three options for the construction of a new ramp leading to the washrooms on the upper level of the park were examined. Option #1 does not disturb any of the trees. This is the least expensive option, but is not a direct route to the washrooms. 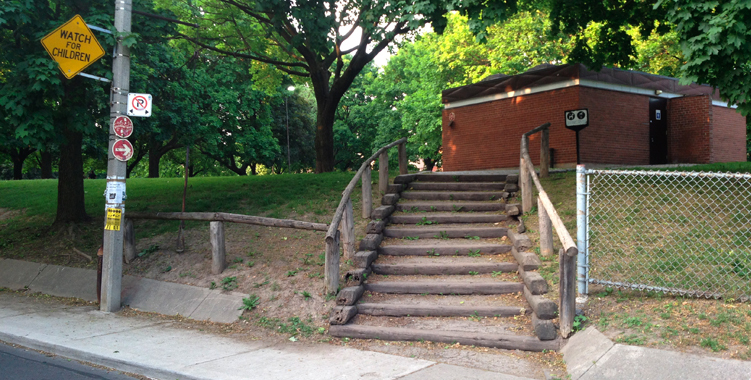 Option #2 involves a 5% slope for the ramp without damaging trees. There is no need for guardrails. Option #3 involves taking out two trees. Requires retaining walls and guardrails. This is the most expensive option, potentially more than the money allocated. There is large variation in the costs of the various projects with about a $30,000 difference between options. We are receiving funding for this ramp from the AODA fund that pays for greater accessibility for people with disabilities. The stairs are being paid for our of SOGR Capital Funds. The closer the ramp connects to the washroom the better for accessibility it will be. This goal also provides us with more room in the middle of the park for future projects. There is some extra money for the second ramp, but it will more likely not happen until next summer. The ramp will take about a month to construct. The latest the city wants to be there is the end of September. We will need to put pressure on forestry people to remove trees. The trees in the way of the proposed ramp locations are non-native, and diseased, invasive species. We can add more trees to the playground area on the lower level as replacements, with shrubs to replace in ramp location. Will need to replace each removed tree with 3 new trees in same park. Steering committee to recommend location. Aphalt is cheapest option for the path (approx $55/sq. metre) and the city will likely be advocating for asphalt. Concrete is another option for path surface. Concrete is the more durable material but much more expensive (approx $105/sq. metre) and needs more maintenance. Stamping, width, and borders were also discussed. Moisture could be a problem Fred Hamilton suffers from drainage issues. We will have to fix the drainage problem of Garrison creek. We could use a drywell to support drainage in the park. We also discussed the potential of adding a Garrison creek medallion at the ramp location during construction. We will have to go through the heritage department to get approval. We will need to inform Rich soon, how big the sign is for the blueprints if we are embedding it into the concrete on the ground. There are other ways to address heritage if we cannot get a medallion. The group agreed to go forward on the amended option #2 for ramp construction. Rich will provide a revised drawing. The steering committee consent is enough to go forward with the project. While community consultation is not officially required for moving forward, Steering Committee wants opportunity to notify via website and newsletter updates. A curb cut will be required on east side of Roxton Ave where ramp intersects with street. Rich will include in proposal use of Armour stone (limestone) on the steps instead of current timber solution. FoRRP asked if a section of the fence along Roxton could be removed where the sidewalk and park are at same grade to allow bikes, strollers to enter playground level directly.